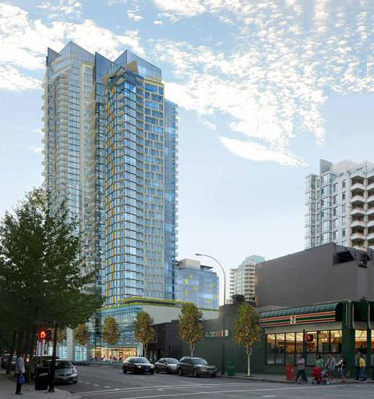 Multiple new Vancouver high-rise condo towers may be on the go as the proposed Burrard Gateway real estate development project reaches the city proposal stage. A joint effort between Reliance Properties and Jim Pattison Group may see the development of three large Vancouver high-rise condo towers in what may become the largest project the city has ever seen. Named the Burrard Gateway Vancouver real estate proposal, Jim Pattison and Reliance Properties hopes to redevelop this part of town with a $500 million proposal constructed near the north end of the Burrard Bridge in downtown Vancouver. 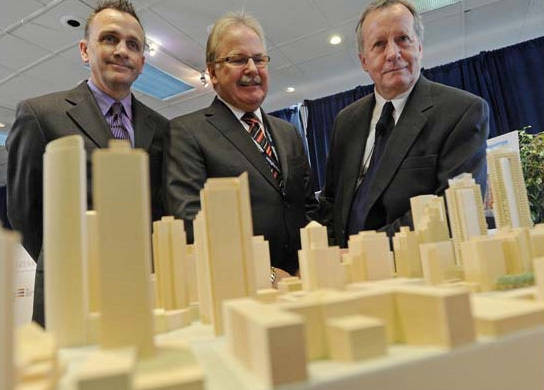 As the City of Vancouver mulls over height restrictions, the proposed Burrard Gateway Vancouver real estate development proposal makes its mark with at least 3 condominium towers that will change the skyline forever. One of these proposed Vancouver Burrard Gateway condo towers may be 48 storeys, either matching or even exceeding the current downtown height restrictions for residential high-rises. The Burrard Bridge north end project site where the Vancouver Burrard Gateway proposal is, is actually 1 of 6 different development sites in which the City of Vancouver is considering changing the height restrictions for specific developments and proposals. An artists’ rendering of the proposed 48 storey Burrard Gateway Vancouver condo high-rise was released as well and it is striking and very beautiful. The project address with be at 1290 Burrard Street Vancouver and 1281 Hornby Street Vancouver in downtown. The site area is approximately 69,000 square feet and the dimensions are north parcel (225’ along Burrard by 120’ along Drake) and the south parcel (350’ along Hornby by 120’ along Drake). The location of Burrard Gateway proposal is at the northeast corner of Burrard and Drake Streets at the entrance of Vancouver downtown’s core. 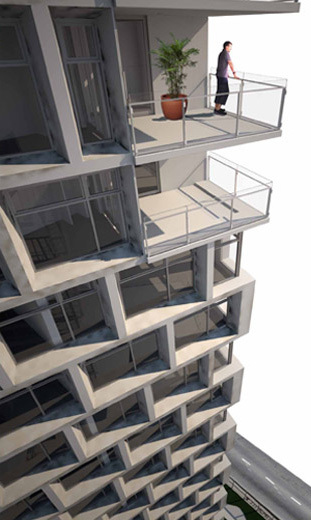 The permitted heights of Tower A at Burrard Gateway Vancouver is 364’ but the project target is 466’ while Tower B permitted height is 300’ and the target is 184’. 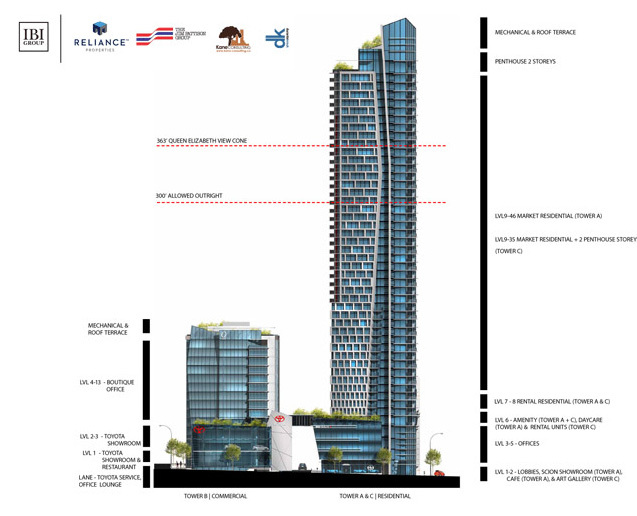 Tower C at Burrard Gateway proposal has a projected target height of 355’ with a permitted height of 360’. The current permitted FSR for the downtown Vancouver Burrard Gateway real estate development site is 5.5 and Jim Pattison Development Ltd and Reliance Properties Ltd is seeking 11.22 FSR. 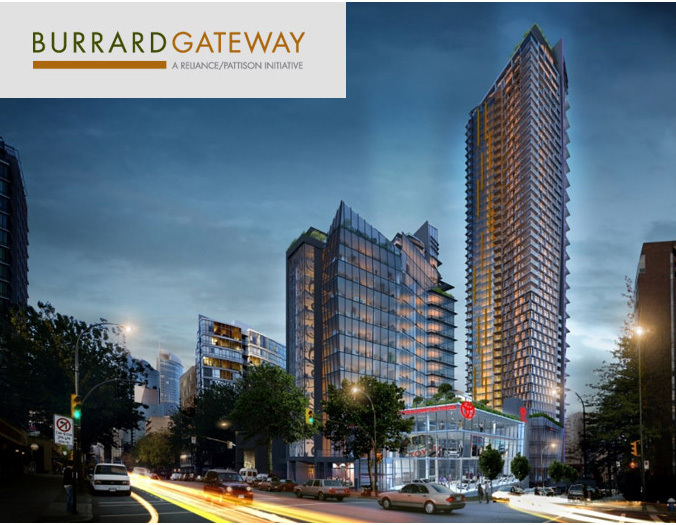 – Burrard Gateway Towers A & C will have 55,096 sf of rental residential and 491,775 sf of market residential in addition to 3,357 retail commercial and 98,444 sf office commercial. The amenity space will include 5,175 sf daycare facility and 12,061 sf other onsite residential building amenities. – Burrard Gateway Tower B will have no residential units but will have 40,053 sf of retail commercial and 106,015 sf of office commercial. New Vancouver skyscrapers may be on their way if the Burrard Gateway Building Project proposal is passed by city hall in the next year. This mega Vancouver real estate development could even break ground early next year if the city likes what they see in the proposal. Costing about $500 million, the join effort between Reliance Properties and Jim Pattison Group will see the development of at least three high-rise Vancouver condo towers at the Burrard Gateway Building Project site which is located at the north end of the Burrard Bridge. The entire project site actually spans an amazing twenty three (23) city lots near Hornby, Drake and Burrard Streets. This master planned Downtown Vancouver Burrard Gateway Building Project proposal is for a mixed use neighbourhood complete with commercial, retail and residential space. According to MetroNews Vancouver and the Vancouver Sun, if all goes well with the proposal stage, the Burrard Gateway Vancouver real estate development may even start in the next 1½ years. 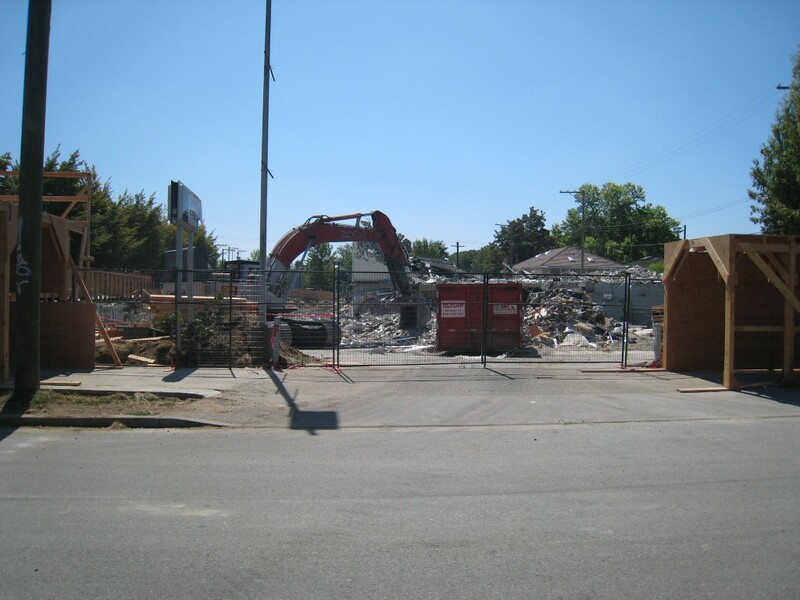 The 23 city lot project requires rezoning by the city in order to move forward. The public hearing may be advanced by Spring 2011, allowing residents and all parties to voice their opinion to the City of Vancouver. City Council will take all opinions and concerns regarding everything from increased traffic, parking, rezoning, residential units, commercial space etc into account before moving forward. In addition, the downtown Vancouver Burrard Gateway Building Project will ask for Vancouver condo high-rise towers that exceed current height restrictions in the area. 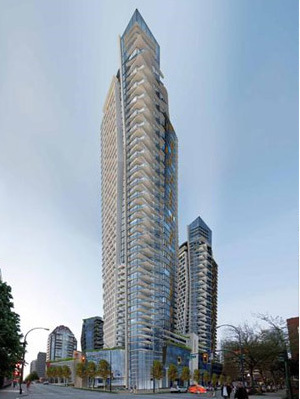 Currently, the downtown Vancouver height restriction is 466 feet, and the proposed Burrard Gateway condo tower will be 48 storeys, which is above the 466 ft restriction. As Burrard Bridge is a gateway in and out of the downtown core, the high-rise tower will provide a great landmark building when entering the community. The architect, Jim Hancock explains that this is a great gateway project for the downtown Vancouver neighbourhood. If approved in 2011, the Downtown Vancouver Burrard Gateway building project will take 4 years for construction, with an estimated completion date around 2015 to 2016. The presales Vancouver condos at Burrard Gateway condominium towers will begin a year or so before the completion date and will launch a wide variety of floorplans catered towards sustainability, functionality and affordability. Here are some highlighted points from the recent Vancouver Sun and MetroNews Vancouver press releases regarding the proposed Vancouver real estate development at Burrard Gateway Building Project. A landmark $500 million master planned neighbourhood is being proposed to City Council for the development of the north end of Burrard Street Bridge. A combination of residential and commercial towers will be incorporated in addition to a podium. The joint effort for the proposed Vancouver Burrard Gateway development is between Jim Pattison Group and Reliance Properties. The tallest proposed Burrard Gateway Vancouver condo tower will be 48 storeys and will exceed the current city height restriction of 466 feet by about 102 feet. As 1 of 6 sites that the City Council is considering highrises exceeding the height restriction, the Burrard Gateway Vancouver condo tower may be passed. The 23 city lot development will have over 770,000 square feet of space and will dramatic change the north end of Burrard Street Bridge in downtown Vancouver real estate district in the upcoming years. The rezoning will need to take place and a public hearing Burrard Gateway Vancouver development may start in the spring of 2011. If the hearings and rezoning go smoothly, the Burrard Gateway development may even be complete as early as 2014, but more likely in 2015 to 2016. The 23 city lots that make up this project site are split up as 9 owned by Jim Pattison Developments and 14 owned by Reliance Properties. The entire project is made up of three towers of 13, 36 and 48 storeys in height. The taller two Burrard Gateway Vancouver towers will be residential while the 13 storey tower will be commercial. There will be a 7 storey podium with commercial and residential space. On site, the Burrard Gateway Development will also feature a Toyota Dealership, new daycare, car share co-op program, parking for 800 bikes, community gallery space and money for rental housing for the Downtown Eastside. 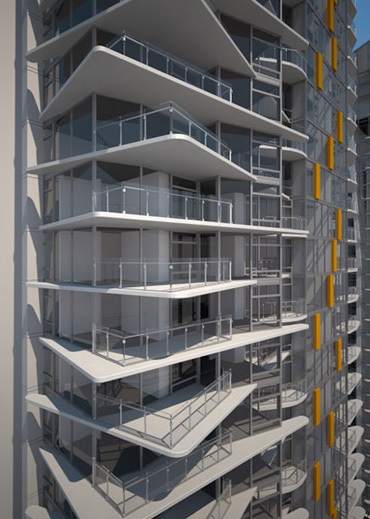 The 600 residential units here at Vancouver Burrard Gateway condos will have LEED gold status. The architect is IBI/HB Architects and the project site ecompasses the 1200-block Burrard Street and 1200-block Hornby Streets in Downtown Vancouver real estate market. For more information visit www.relianceproperties.ca or www.jimpattison.com. 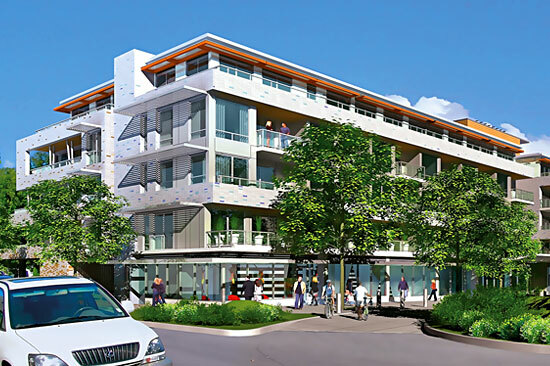 The Burrard Gateway Proposal follows another large redevelopment called the Vancouver Marine Gateway Proposal at Marine Drive and Cambie Street. The Burrard Bridge enters downtown Vancouver askew to the regular angle of the downtown street grid. 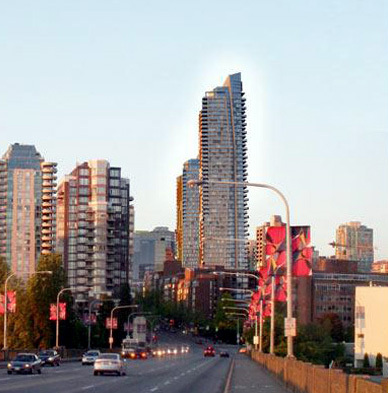 The urban design concept of Burrard Gateway Vancouver is to locate a landmark higher building at an axial view from the Burrard Street Bridge approach, an alignment that carries significant visual power and allows the landmark to anchor the entrance into the downtown core. The proposed changes for the proposed Burrard Gateway Vancouver real estate development: Allow consideration for a single higher building of generally 500’ at the Downtown Toyota site (1290 Burrard Street) to mark the axial view from the bridge arrival and to stand out as the dominant landmark in addition to allowing consideration of slightly increased height beyond existing policy heights for other sites along Burrard Street without diminishing the strength of the axial view. A writer balances partying down and growing up at the tip of Baja. Cabo. The name conjures up images of buff So-Cal youths hanging upside down for tequila shots at Sammy Hagar’s Cabo Wabo. If that sounds awesome(! ), then you and my 1995 incarnation would get along like a casita on fire. But now that I’m a little closer to 40 than 30 (and by a little I mean a lot), the all-night party scene at my vacation destination is less of a pull than it once was. But, lately, Los Cabos—the twin towns of Cabo San Lucas and San Jose del Cabo, on the tip of the Baja peninsula—has also come to signify a stratum of vacation that calls to me: infinity pools, private beaches, towel valets and haute cuisine. Chilled pineapple skewers delivered poolside instead of late-night pizza slices eaten curbside. These days, Cabo is more Jennifer Aniston (who famously held her 41st birthday here), less Megan Fox. I arrive too late to hit the beach, but a Five Star Diamond Award-winning beachside restaurant, De Cortez Grill and Restaurant, fits the bill for an easy transition into vacation mode. At first the stiff ocean breeze wants to force me inside, but our server knowingly assures me to wait for sunset—when, true to form, the wind slackens, then disappears altogether. I opt for a local organic shrimp salad, and move on to tuna that’s been scented with clove and garlic and topped with rich pancetta and spring onions—along with a sweet chimichurri sauce that nods to our locale. I’m surprised by and enamoured with the Mexican pinot noir the waiter recommends. I end the night with an icy glass of local liqueur Damiana, made from the flower of a shrub of the same name—a little like ending the meal with a sweet herbal tea. The Rubenesque woman on the Damiana bottle—local legend says the elixir boosts fertility—looks a little like my own reflection these days, but the next morning I don my two-piece anyway and head down to lounge by the—I’m relieved to discover—decidedly grown-up pool. A concierge offers to polish the sunscreen off my sunglasses. The 12-foot waves on the beach in front of me are too rough for swimming, but they sure make for pleasant audio accompaniment to a day where my toughest decision is which fruit-laden drink to order for happy hour. My workout consists of periodically lifting the 1,000 or so pages of the Girl with the Dragon Tattoo. I’m pretty sure a few days pass this way (time becomes an elastic concept under such conditions), but one afternoon I seek a reprieve from the relentless pampering and head into the nearby small town of San Jose del Cabo. Where Cabo San Lucas is urban big city, San Jose del Cabo is a sweet Mexican village of vintage adobe buildings, winding streets and an interesting art district—all charming and age-appropriate. But just off the main square I catch sight of a sign that says “Shooters” and I allow myself to investigate. I head up to the rooftop bar—just getting going at this early hour—and chat with the owner. It turns out that Terry Erickson is a Calgarian by way of Whitewood, Saskatchewan, who drove down to Cabo to stay for a week—nine years ago. His charming open-air canteen prides itself on offering “the only 10-peso beer in Los Cabos,” which might be a bad thing, if it weren’t an icy Corona, paired with decent guacamole in friendly grass-hut-style environs. It’s also ground zero for playoffs games, and though Erickson is a Flames fan, he keeps that under wraps from his mostly Vancouverite customer base on Canucks night. “I know which way my bread is buttered,” he laughs. Back at the hotel, a nighttime beach stroll brings me past a happy wedding circle gathered around a campfire. There’s a lot of light revelry, good spirits and a cache of marshmallows, chocolate and graham crackers for a late-night ’smores party. This is my kind of beach party. In the distance, fireworks light up the night, their crash challenged only by the roaring surf. On my final night I decide to introduce my old self to my new self—there will be tequila, but it will be a decidedly adult and expensive tasting of handcrafted expressions of the spirit (see “4 Shame-free Tequilas,” page 84, for the results). In lieu of the traditional salt and limes, each tasting—from the young and herbal blanco to the smoky aged añejo—is followed by the house’s special recipe of sangrita (literally, “little blood,” not to be confused with the Spanish sangria). Its blend of fresh pineapple, grapefruit and orange juice—with some cilantro and jalapenos thrown in—both warms us with its spiciness and cleanses our palates as we move on to the stronger stuff. The shudder that tequila used to bring on is replaced by a smile at the rich añejo—vanilla-scented, with more in common with a single-malt Scotch than the shooter version that is the siren call for every college freshman. Feeling both mature and pleasantly warm I head into the heart of Cabo San Lucas. I’m wisely avoiding the whistles of the shooter girls and their happy customers in the famed dive bar El Squid Roe when I’m drawn to what sounds like live Mexican music down a side street. It’s a second-floor karaoke bar projecting the vocal theatrics above down to bypassers below. I stroll up the stairs, take in the festive atmosphere and, courtesy of that last añejo, slap my name on the singer list—a bold decision that seems less and less wise as my turn approaches. Finally my name is called and I timidly approach the stage. As the supportive, largely Mexican, crowd starts cheering me on, it isn’t long before the host and I are belting out “Don’t Let the Sun Go Down On Me.” Deep in song I’ve already forgotten that I’m also serenading the legions of party­goers stumbling out of El Squid Roe below. It seems you can take the girl out the party, but Los Cabos brings the party back to the girl. With predictions for this winter to be the coldest and wettest in 50 years, and the number of homeless people on the rise in the Lower Mainland, the need for warm blankets could be at its highest in its 16-year history, according to the Real Estate Board of Greater Vancouver. The Realtors Care Blanket Drive runs November 29 to December 6 at over 100 real estate offices across the Lower Mainland, collecting blankets, bedding and warm and waterproof clothing for the homeless and working poor. Over 30 charities from Whistler to Chilliwack receive, on average, more than 4,000 bags of gently used or new items donated by Realtors, their clients and the public. Earlier this year, the City of Vancouver announced that the homeless count in Vancouver has increased 12 per cent since 2008. Also, meteorologists are calling for a La Nina weather cycle this winter, meaning colder-than-normal temperatures and heavier precipitation. Donations to the Realtors Care Blanket Drive stay within the communities in which they are donated, or if the volumes are too large, go to charities in greatest need in neighbouring communities. The 2010 Realtors Care Blanket Drive runs from November 29 to December 6. To find a list of all drop-off locations and charitable recipients, go to www.blanketdrive.ca. With less homes being listed for sale and less home selling, prices have stabilized in most local markets, reports the Real Estate Board of Greater Vancouver. The benchmark price for all residential properties in Greater Vancouver over the last 12 months has increased 4.6 per cent to $579,349 in October 2010 from $553,702 in October 2009. Since June, however, residential home prices in Greater Vancouver have remained relatively unchanged, declining 0.2 per cent. “We’ve seen a lot more consistency and less volatility in recent months when it comes to both number of sales and pricing, although it’s important to remember that conditions often vary between communities and neighbourhoods,” said Jake Moldowan, Board president. The number of housing sales in Greater Vancouver totalled 2,337 in October, a 36.9 per cent decline from October of last year. Total active listings on the Multiple Listing Service currently sit at 14,075, an 8.6 per cent decline from last month and a 16.4 per cent increase from October 2009. Total new listings declined 25.7 per cent to 3,698 in October compared to October 2009. The benchmark price for detached houses increased 6.3 per cent from October 2009 to $796,883. Sales of apartment properties are down 38.8 per cent compared to October of last year. The benchmark price of a condo apartment increased 2.4 per cent to $390,074. The benchmark price of an attached unit (usually a townhome) increased 4 per cent between $487,530, the Board reports. The city’s policies for laneway housing remain unchanged as of council’s Nov. 2 meeting. The Vision-dominated council asked staff to study how to make one-storey laneway homes more viable, and to consider a discretionary approach to one-and-a-half storey homes. Eighty-three per cent of the laneway homes approved as of July are one-and-a-half storeys high with traditional pitched roofs. COPE Coun. 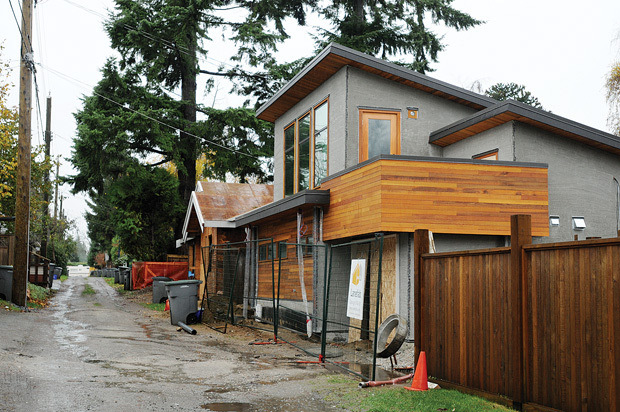 Ellen Woodsworth had called for a four-month moratorium on new laneway homes so concerns expressed by the public could be addressed, but her bid for a breather was rejected. Nearly 200 laneway homes have been approved by the city in the last year. Residents have complained to the city about seeing big laneway houses go up and not learning they were approved for their neighbourhood until builders broke ground. NPA Coun. Suzanne Anton had wanted staff to consider allowing laneway houses to be only one storey, instead of up to 20 feet tall, or six feet taller than garages. “If they all looked more like garages and fit into the landscape in the same way that garages have formerly fit into the landscape, I don’t think people would have cared at all,” she said. Brent Toderian, the city’s director of planning, said owners building laneway homes tell the city the second half storey is critical to make units livable. But Anton doesn’t buy it. Staff will explore allowing single-storey laneway homes to extend a few feet into backyards. “We don’t want to go too far in that direction because it’s very important to us to keep the backyard for both livability reasons and urban agricultural reasons,” Toderian said. Staff will also report back to council about the pros and cons of making one-and-a-half storey laneway homes a discretionary approval. Staff will consider reducing the maximum unit size of 750 square feet, which doesn’t include garage and storage space. Staff will also consider delaying the requirement of sewer separation for laneway homes until the principal house is redeveloped. The city required separate sewers to avoid overflows, but delaying the requirement could save homeowners $6,000 to $8,000 in city fees and even more in excavation, piping and landscaping costs. Toderian maintains most Vancouverites are pleased the city has allowed the housing option, which can’t be strata-titled or sold. “It’s a rental supply option. It creates a much more adaptable and nimble single-family housing form and we constantly hear stories about how it adds flexibility to peoples’ lives from a mortgage helper perspective or a caregiver perspective or an aging member of the family perspective,” he said. Staff will report back to council on the height and size of laneway homes next year. 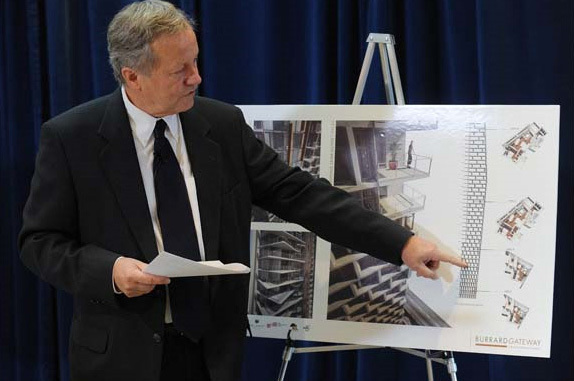 They’ll also report in 2012 after final inspections on 150 units are complete. Canada’s residential property sector appears to be stabilizing based on separate reports released Monday. National resale housing activity picked up for the third straight month in October, according to data from the Canadian Real Estate Association. Existing homes sales via CREA’s Multiple Listing Service climbed 4.6% in the month after similar increases in August and September. Three-quarters of local markets were higher with Toronto and Vancouver leading the gains. “The continuation of low interest rates is supporting sales activity, which has been improving over the past few months in a number of major markets including Vancouver,” said CREA President Georges Pahud. Resale activity is now 13.3% above the market’s July trough. 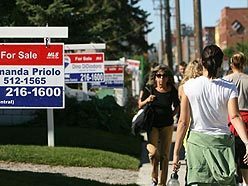 Canada’s residential property sector set a blistering pace of activity in the second half of 2009 and the beginning of 2010. But with pent up demand exhausted, tighter mortgage lending rules and the introduction of the harmonized sale tax in Ontario and B.C., the national market cooled in the summer months. CREA said the early fall numbers suggest the ups and downs of the market may be leveling out. “National sales activity is now running almost halfway between the highs and lows posted between late 2008 and late 2009,” said Gregory Klump, CREA’s chief economist. Average resale house prices inched up less than a full percentage point over a year ago to $343,747 in October. New listings also rose in October, up 1.3% on a seasonally adjusted basis. New listings however remain 14% below the recent peak reached in April 2010. Still the supply-demand picture remains roughly balanced, CREA said. “If you’ve ever wondered what a soft landing in housing looks like, this may well be it,” said TD Economics’ Pascal Gauthier in a note Monday. Meanwhile the Canadian Mortgage and Housing Corporation said Monday it expects new housing starts will continue to moderate for the remainder of the year setting the scene for more stable growth in 2011 and only slight price increases. Housing starts are expected to be in the range of 148,000 to 202,300 units in 2011, down from 176,700 to 194,700 units in 2010. “High employment levels and low mortgage rates will continue to support demand for new homes in 2011. Nevertheless, housing starts will decrease to levels that are more in-line with long-term demographic fundamentals next year,” said CMHC chief economist Bob Dugan. Based on the market’s recent stability, TD Economics also plans to revise, for the better, its 2011 sales forecast later this week. VIRTUAL TOURS: Three of Canada’s most energy efficient and environmentally friendly houses, all CMHC’s Equilibrium Housing projects, are now open to online virtual tours. Virtual visitors can view the interiors and exteriors of the homes as they navigate through the houses. 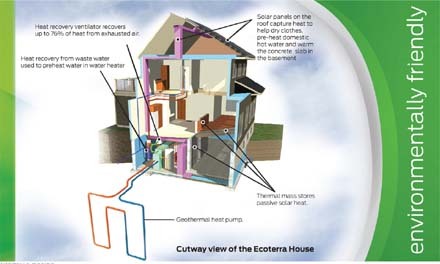 By clicking on the “hot-spots”, users can also learn about the technologies and practices used in the design and construction of these innovative homes, from Alberta (shown) to Quebec. For the tours, go to www.cmhc-schl.gc.ca/popup/vtours. Photo: Eco Terra house. A new RBC study conducted in October finds overall intentions to purchase a home in the next two years remain steady at 22 per cent and have not changed since January 2008. As well, national renovation intentions are slightly higher than last year as 70 per cent of respondents are planning to renovate or make home improvements in the next two years. “Despite recent economic events, Canadians still believe a home is a good investment and many are continuing with their home improvement plans,” remarked Catherine Adams, RBC Royal Bank’s vice-president, Home Equity Financing. To finance their reno expenditures, Canadians will be less likely to tap into cash or savings than they have in the past. Only 28 per cent would consider using the equity in their home, down from 41 per cent in 2007. When it comes to top mistakes or renovation disasters, Canadians who have completed a renovation in the past two years, blame going over budget (26 per cent); using the wrong contractor or tradespeople (14 per cent); choosing the wrong products (12 per cent) and doing it myself (11 per cent). Members of 101 local real estate boards have ratified an agreement between the federal Competition Bureau and the Canadian Real Estate Association that will mean more choices for consumers and more open access to the Multiple Listing Service (MLS.) It would allow consumers to choose what services they want from their real estate agent when selling their homes and pay only for those services. “I am pleased that CREA members have voted in favour of this agreement,” Commissioner of Competition Melanie Aitken said in a release. CREA president Georges Pahud concurred. “We are pleased that after careful consideration and reflection, real estate boards and associations from across Canada have endorsed the agreement,” he said in a release. Under the deal, CREA must eliminate its ability to adopt anti-competitive rules, including those that discriminate against real estate agents who are hired by consumers to offer a “mere posting” service, the bureau said. The Competition Bureau has been pressuring CREA to change its anti-competitive rules on behalf of realtors and consumers who want more flexible services. Earlier this year, the Competition Bureau ruled full-fee agents were monopolizing the CREA’s Multiple Listing Service system, keeping out agents who accept discount commissions or flat fees. The deal was reached after months of negotiations between the competition watchdog and the CREA, which represents about 100,000 realtors across Canada. The agreement is effective immediately and will remain in force for 10 years with penalties for violations. Housing sales are down in most Lower Mainland markets, but prices are up in many. Listings of homes for sale are rising in some areas, and going down in others. One condominium developer is advertising “blow out” prices, while others say their sales are steady. The Bank of Canada’s key lending rate remains at 1 per cent, but various lenders are offering different rates on both long-term mortgages and variable rate mortgages. And the federal government has brought in regulations covering mortgage qualification and the size of the downpayment, but not for all buyers. Then there is the harmonized sales tax, which covers new homes but not resale homes and is added to some closing costs. Meanwhile, those selling a home need to know how to stage the property, how to get the best market exposure, and what is the right price to list at. In today’s challenging housing market, both home buyers and vendors need the help of a professional Realtor more than ever. Before you even start searching for a home, it’s important to determine how much you can afford to pay. A Realtor will help you identify what you want and take you to homes and neighbourhoods that reflect your lifestyle, needs and price range. He or she will also help you understand property financing, taxes, insurance and the steps you will have to take as a buyer to complete a real estate transaction. Before you list your home for sale, you need to know the asking price. Your local Realtor will provide local market variables and insider advice that will allow you to price at the right value, which is the key to a quick sale. Your Realtor also has valuable advice on preparing the home for sale, holding open houses, and marketing your home to get the widest possible exposure. Finally, for the vendors and buyers, your Realtor can negotiate the sale and handle all the necessary paperwork. B.C. Realtors are bound by ethical and professional business practices that are strictly monitored and enforced to protect consumers. In today’s Lower Mainland market, contacting a Realtor is step No. 1. He or she will help you understand how all the programs work and ensure that you get the maximum benefit possible and guide you through the entire home-buying process and explore all your options. 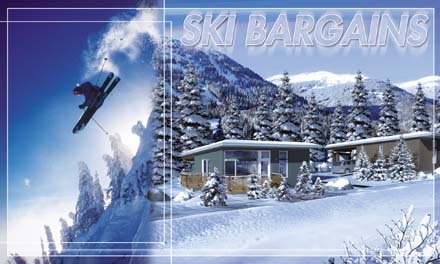 You are currently browsing the Les Twarog Vancouver Real Estate and Condo Blog blog archives for November, 2010.